It’s almost time to ring in the new year Peeps and I’m pretty excited about the adventures that await in 2017. 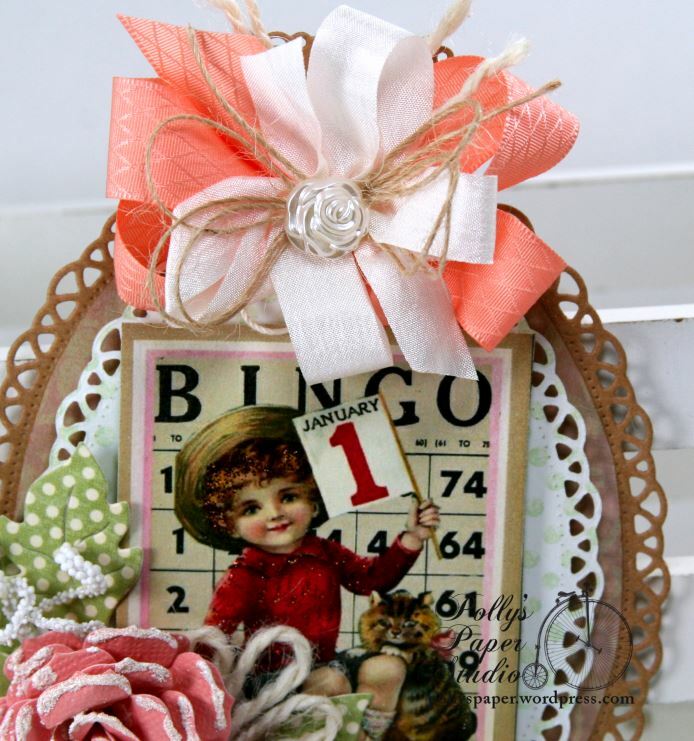 I created this sweet tag with a vintagy New Year’s Bingo Images on layers of Nesting Ovals and topped of with Gardenia’s. I cut these Gardenias from salmon colored cardstock then shaped them and finished the edges with heat set embossing powder. There’s also flourish leaves and spiral stamens. Using spacers between the layers adds a lot of depth. 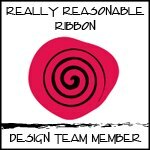 The tag is topped off with perfectly coordinating ribbons and a pretty pearly resin rose. 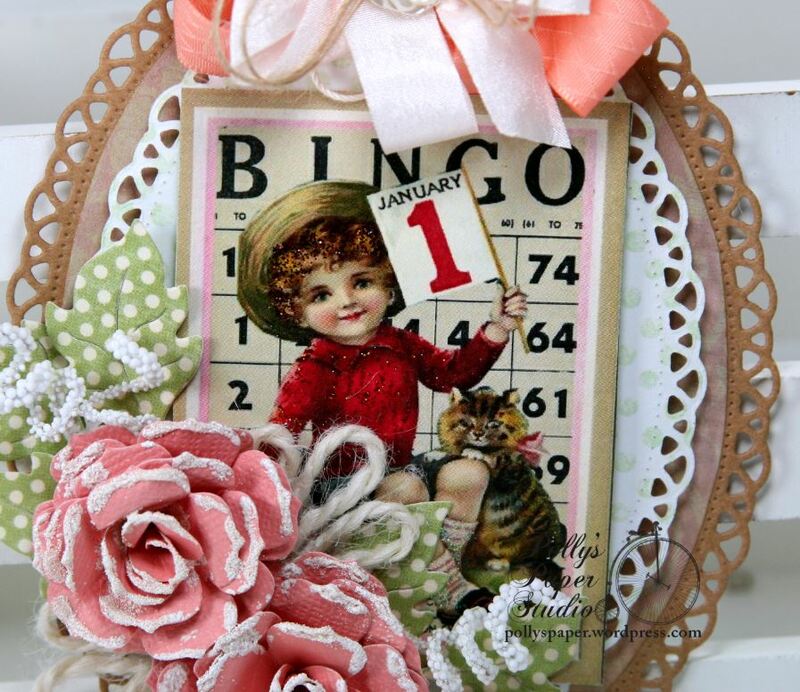 New Year’s Bingo Cards Digital Collage Sheet available for instant download. Hey there Peeps! It’s almost Christmas!!!!! I’m pretty excited to be spending the holiday with my family. Of course there’s prezzies and treats too but my happy place is being with my kiddos. 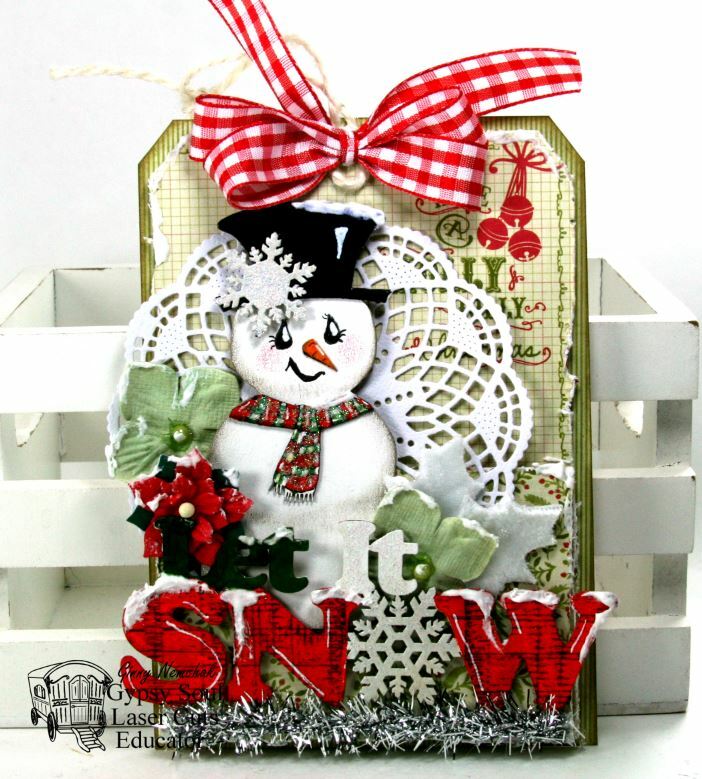 Today I’m dropping in to share a pretty fabby little shadow box I created with RRR trim and some fun and festive embellies. I’m using the Red Chevron Striped Twill for a bow and to wrap around the box so it will have a nice finished edge. Well hello there Paper Peeps! 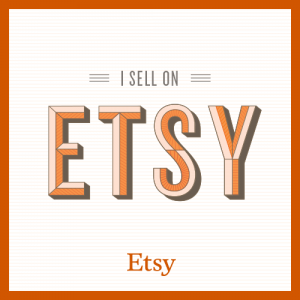 Today’s project is a tag I created for my SIL. During the holidays I create tags for her and my MIL instead of cards. I gifted them a pretty little painted wrought iron rack and when they get new tags for the season, they hang them on the rack to display. 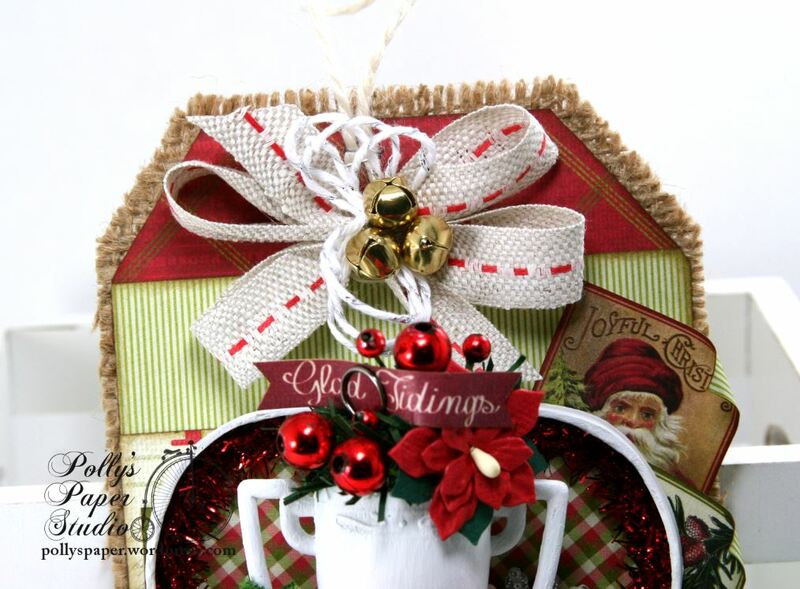 I have decide that my go to ribbon trim for projects with a lot for busy papers is the Center Stitch Burlap. It adds texture for detail instead of pattern so it accents the patterns instead of competes with them. Hey there Peeps. 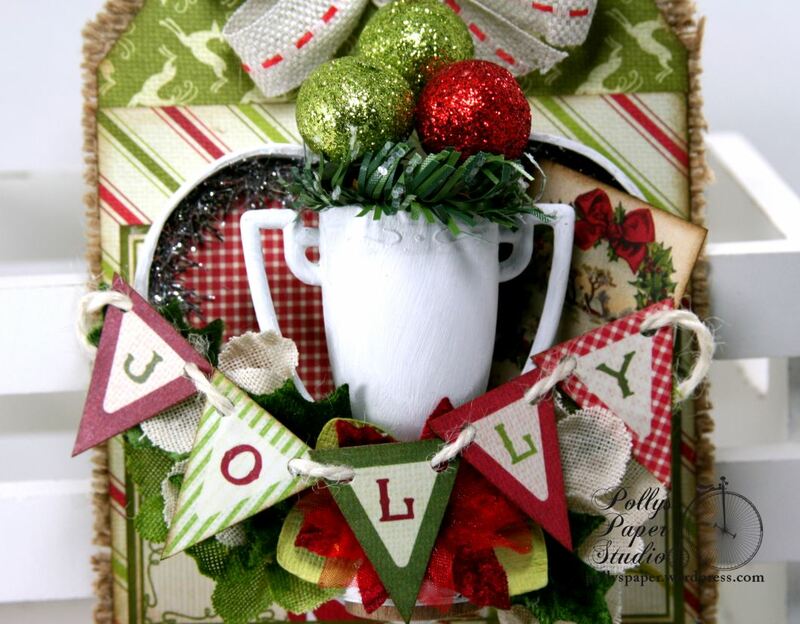 Well we’re all counting down the days till Christmas and maybe sneaking in a few last minute crafty projects. 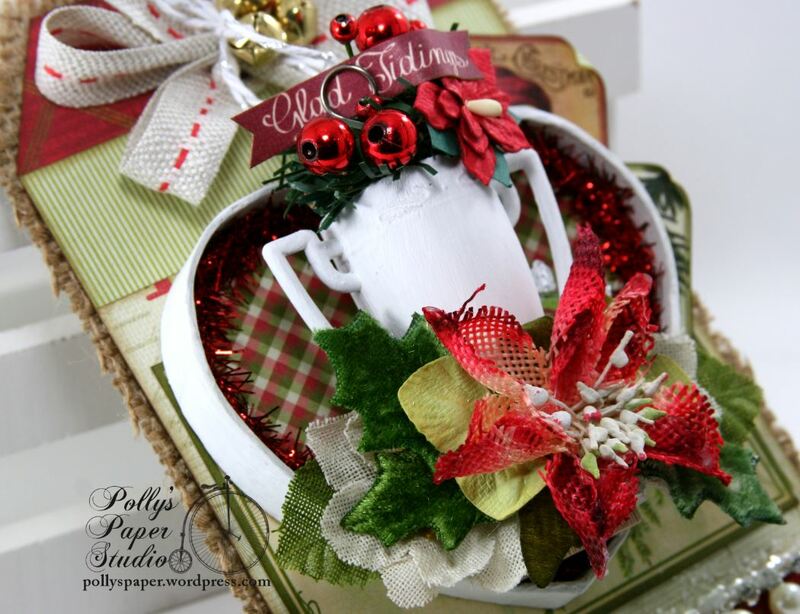 Today I’m sharing a fun and festive tag with the great chippies from GSL and many mixed media supplies. 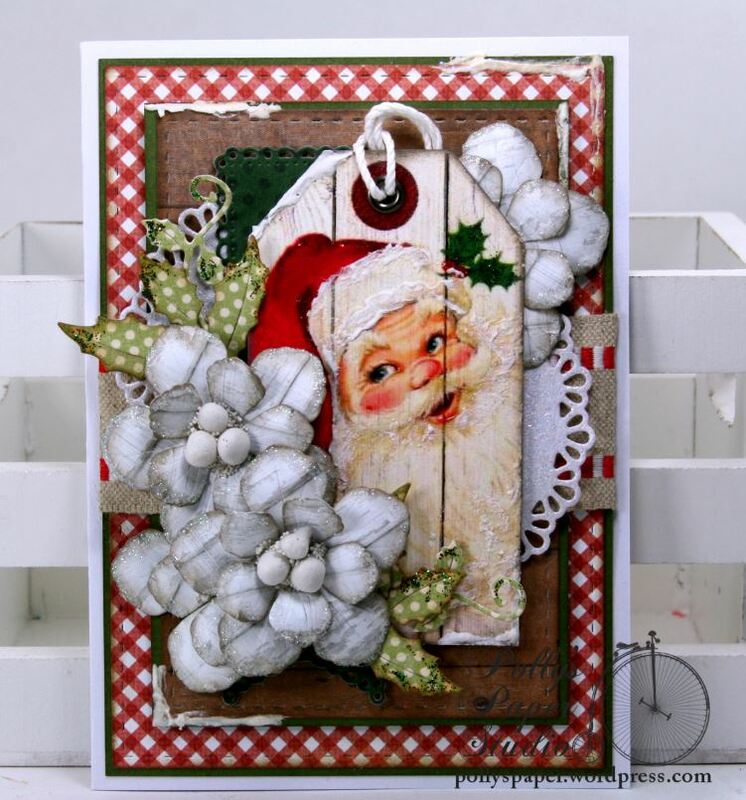 These chipboard pieces are from the Winter Shapes Set and were so much fun to alter. 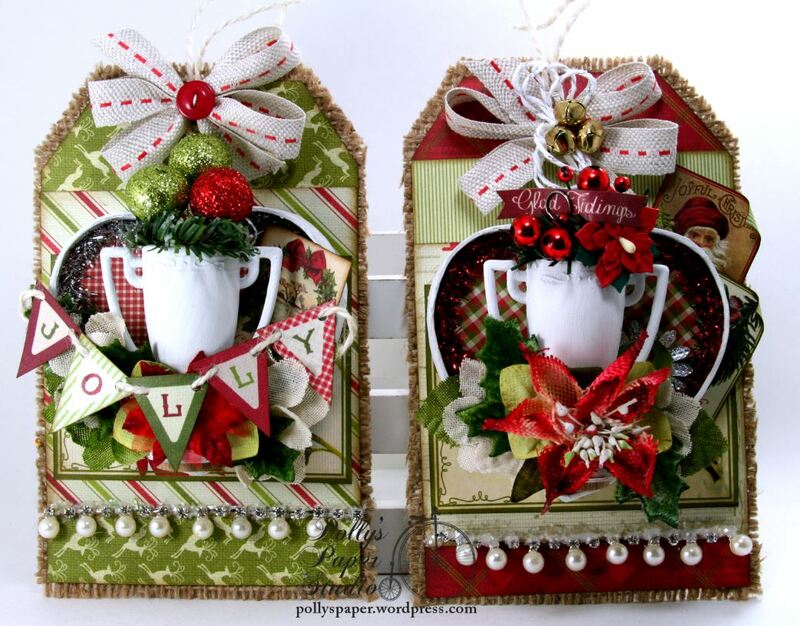 I’ve layered them with tinsel trim, die cut doily, ribbon, and dimensional flowers. 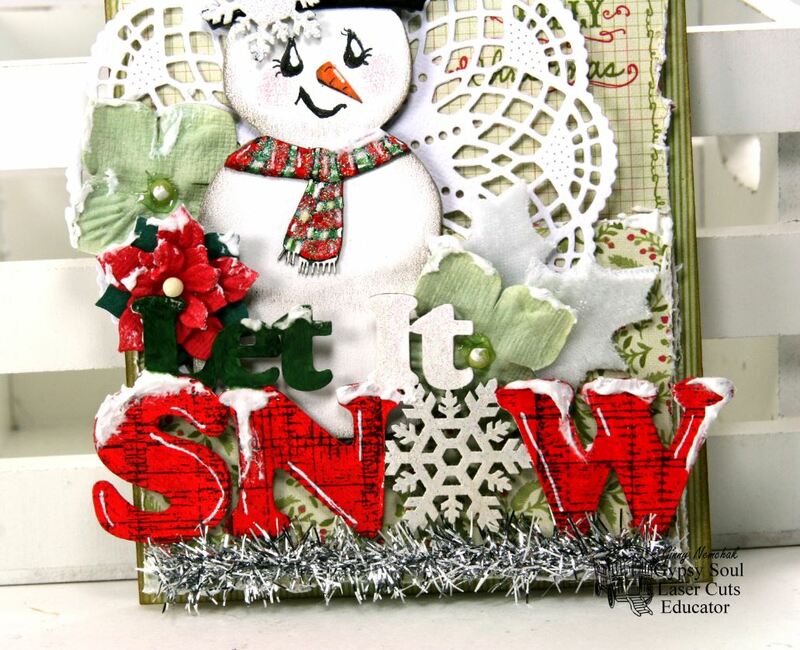 I finished the words in this sentiment with different mediums and added a bit of faux-snow and glitter glue. I’ve added foam spacers between the layers which gave me room to tuck some of the flowers behind. 1. Choose chippies and clean edges to prepare the surface for finishing. 2. Base coat with flat white acrylic paint….add two coats if necessary. 3. 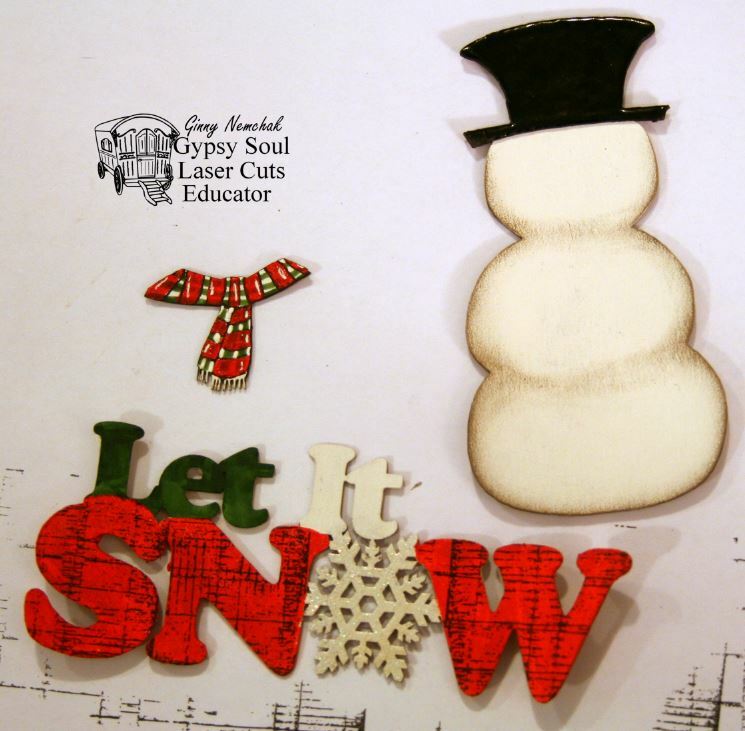 Paint the snow part of the sentiment with red paint and stamp on a texture using archival ink. You will have to mask off the parts that contact the painted red sections. 4. The hat was given a coat of black embossing powder and heat set to give a glossy finish. The small scarf is striped with the paints, markers, and permanent ink pens. 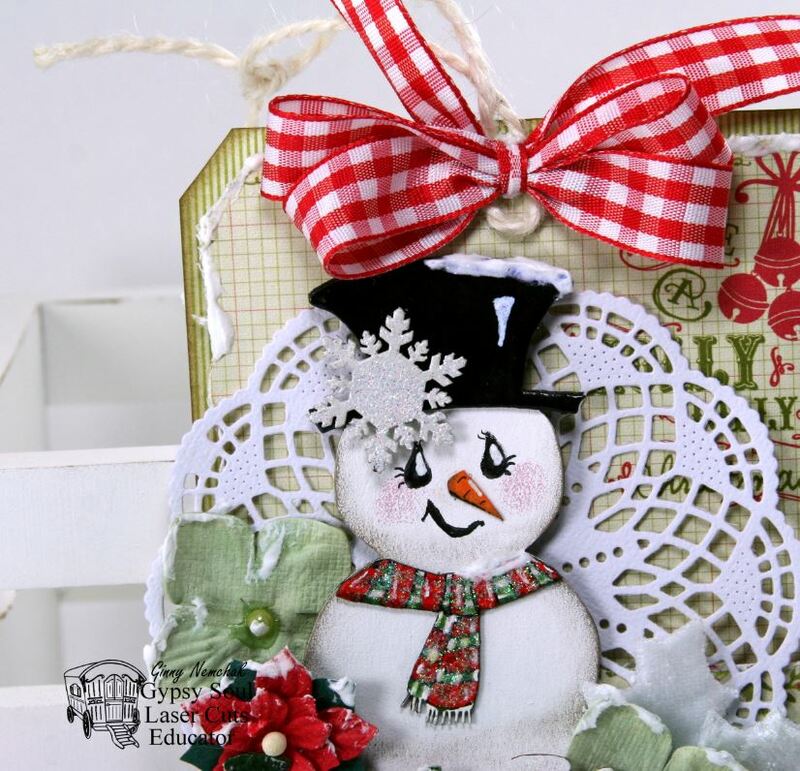 Add glitter glue to the snowflakes and allow to dry before adding the faux-snow. Using a permanent marker add green to the sentiment. 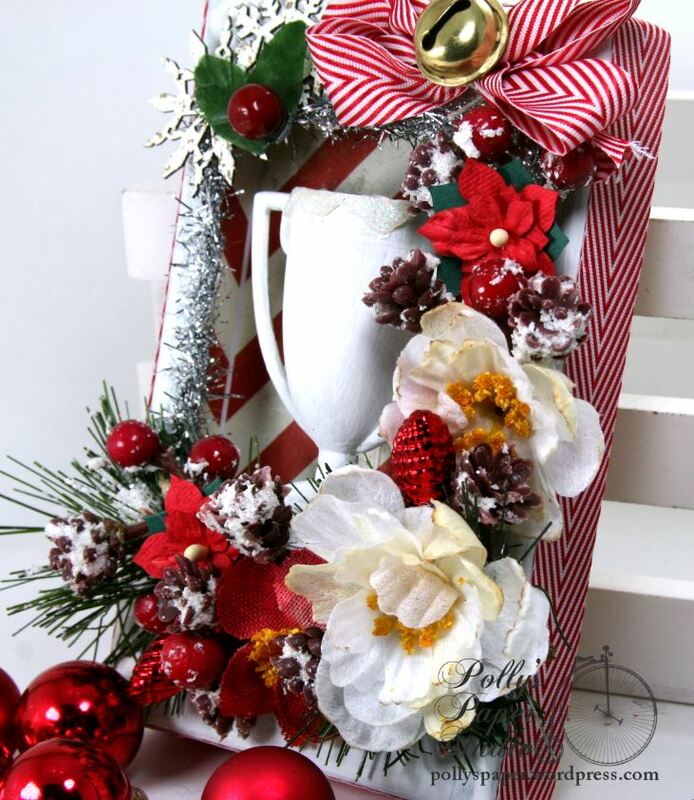 A layer of glitter glue on the scarf adds a festive sparkle. Adding a sweet face gives the snowman a little personality…I did this with Spectrum Noir markers and a Signo white gel pen. 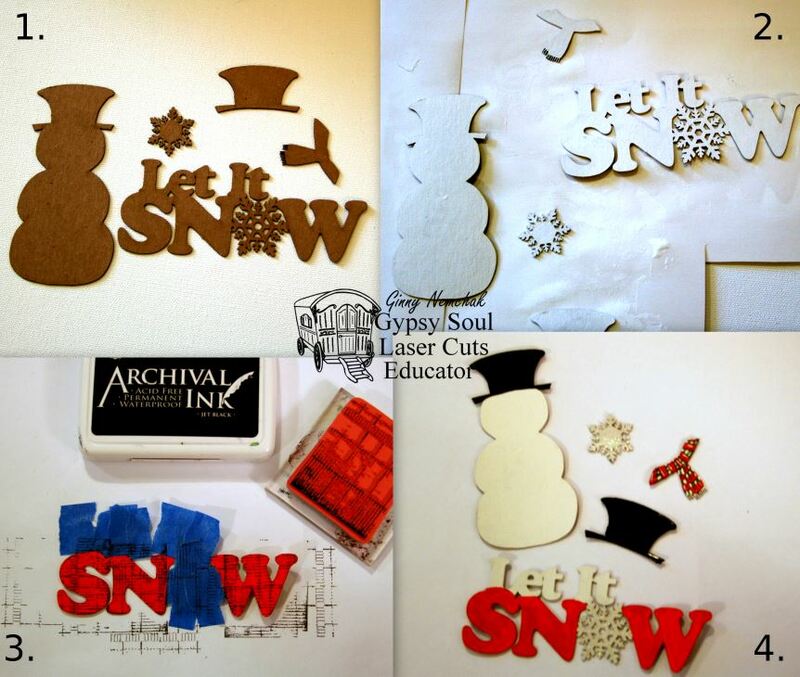 Winter Shapes Set from Gypsy Soul Laser Cuts. Hey there Paper Peeps! 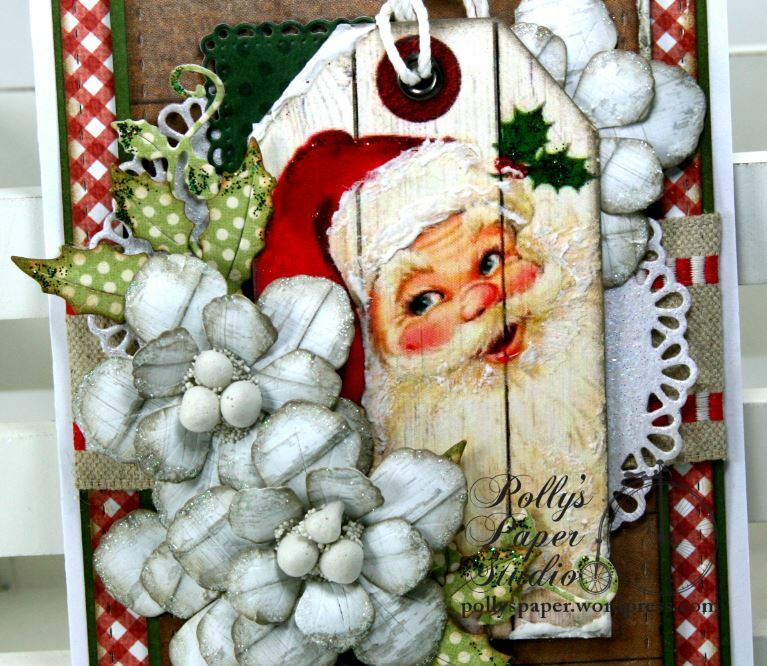 Ginny here to share a great little Christmas card I created with some of my fav Cheery Lynn Designs Dies and Wood Grain Christmas Tag collage sheet from our very own shop. 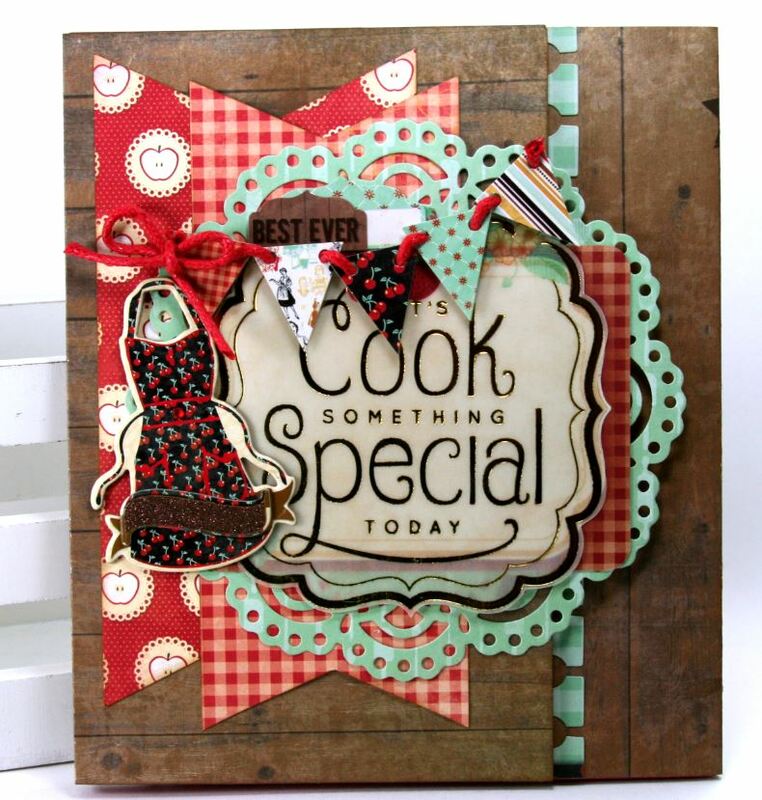 I created the base for this card just slightly larger than a standard A2 size to allow a border around the Rectangle Stitch and cut layers. 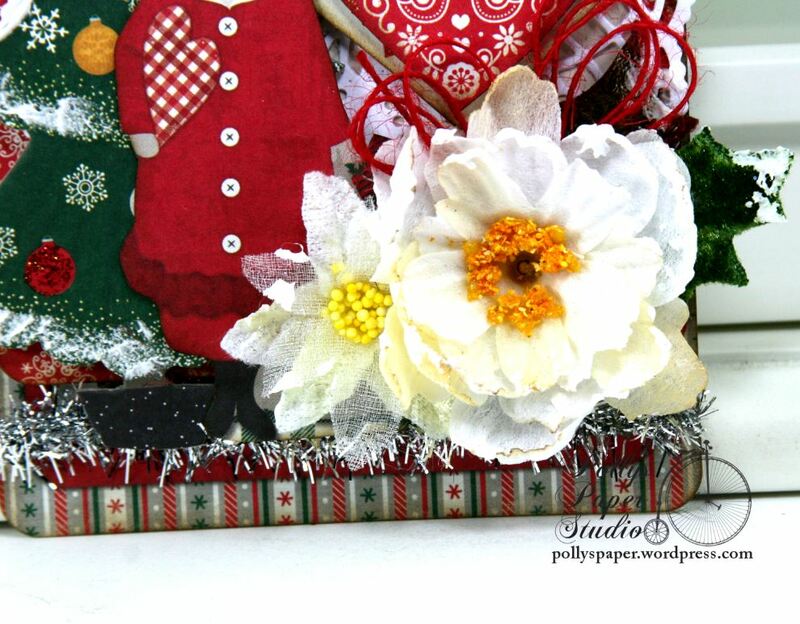 Judy’s Blooms flowers created with subtly patterned cardstock and finished with glitter edges and 3D snowballs. 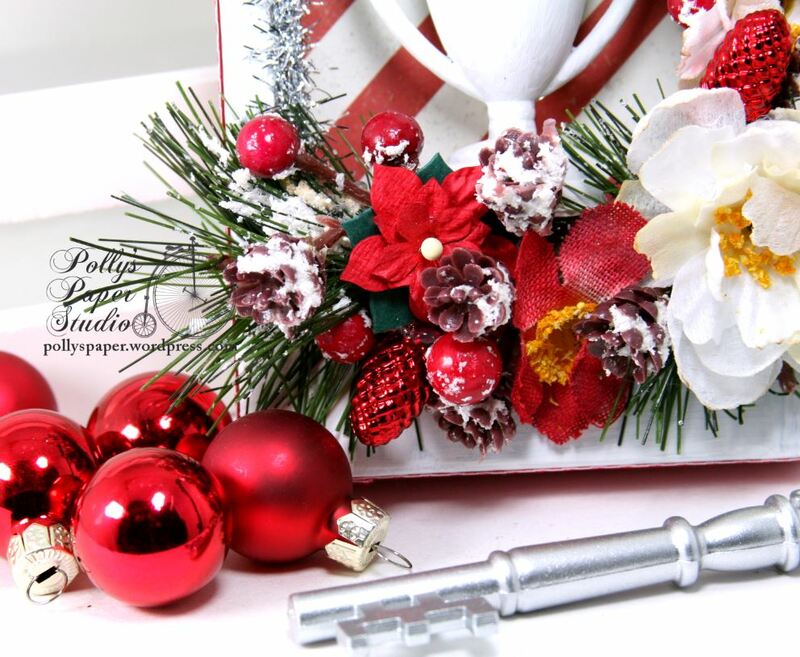 I’ve also tucked in some Holly Corners with coordinating Stickles on the edges. I clipped one of the flowers in half and tucked in under the edge of the tag and over a Nesting Doll Circle and burlap ribbon. 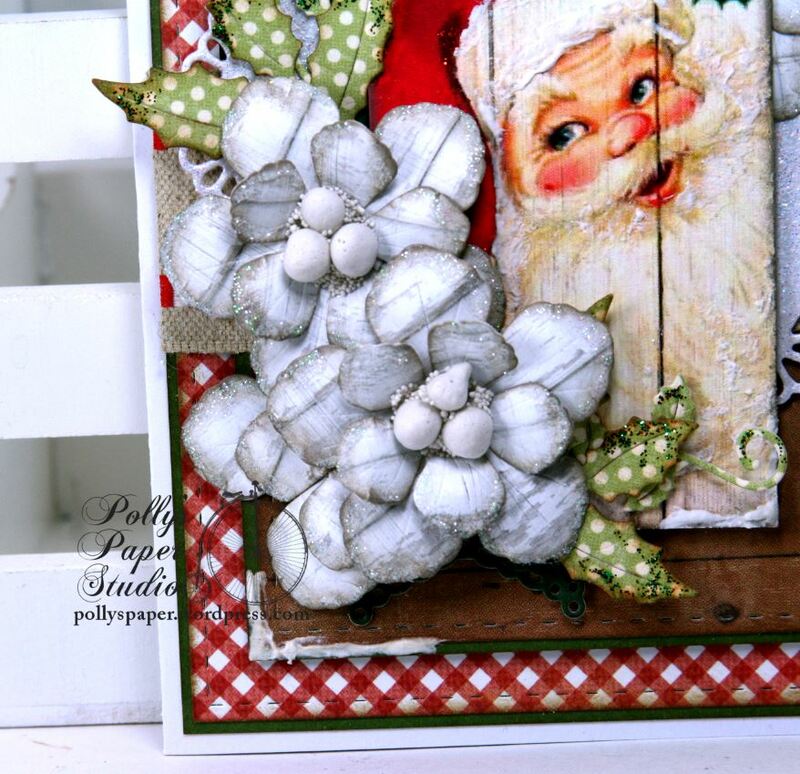 Wood tones and plaid paper patterns are the perfect pairing for a homespun inspired Christmas greeting card with evergreen cardstock borders. 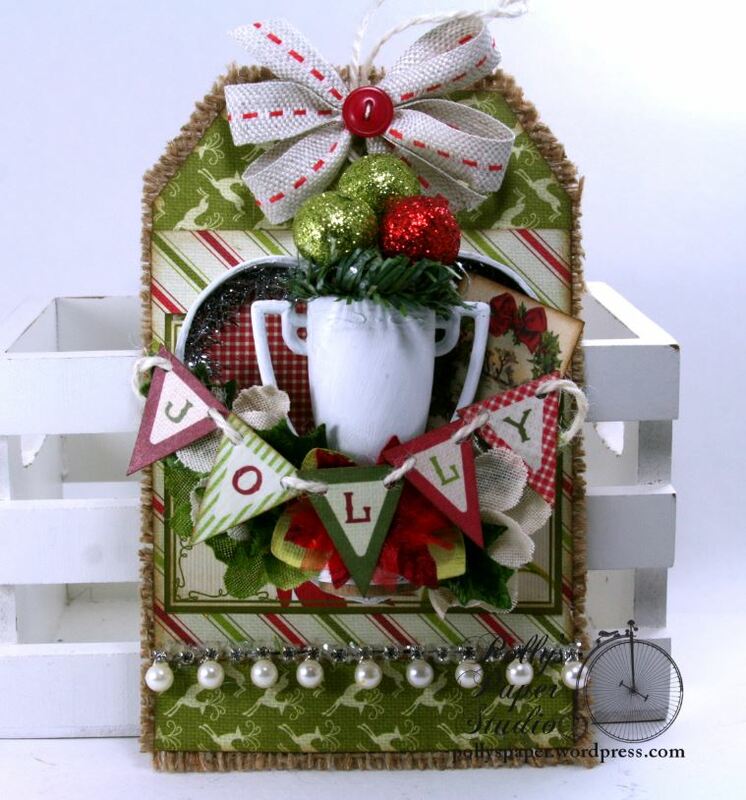 I used the darker green in the center card with a Horizon Fishtail Banner to anchor the arrangement. 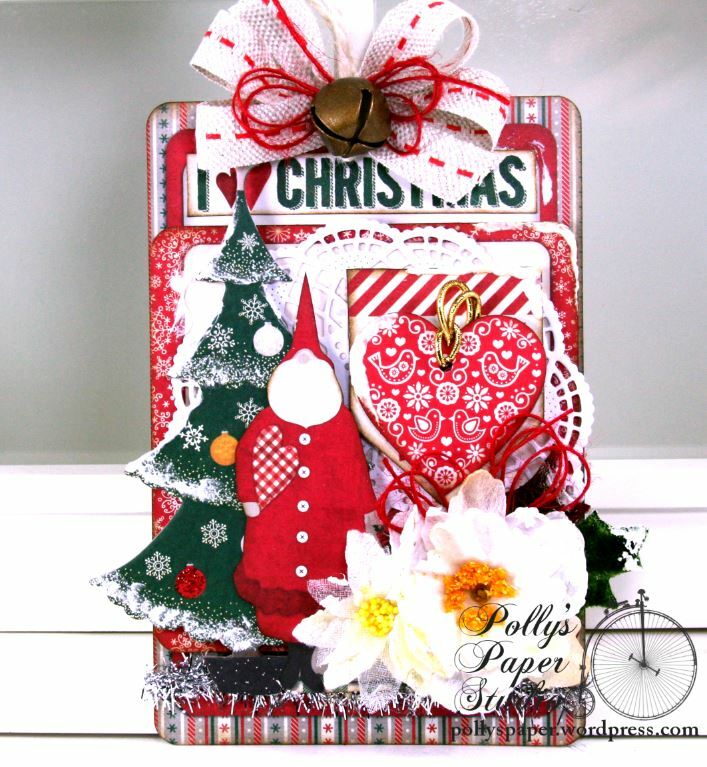 Wood Grain Christmas Tags Collage Sheet from Polly’s on Etsy. 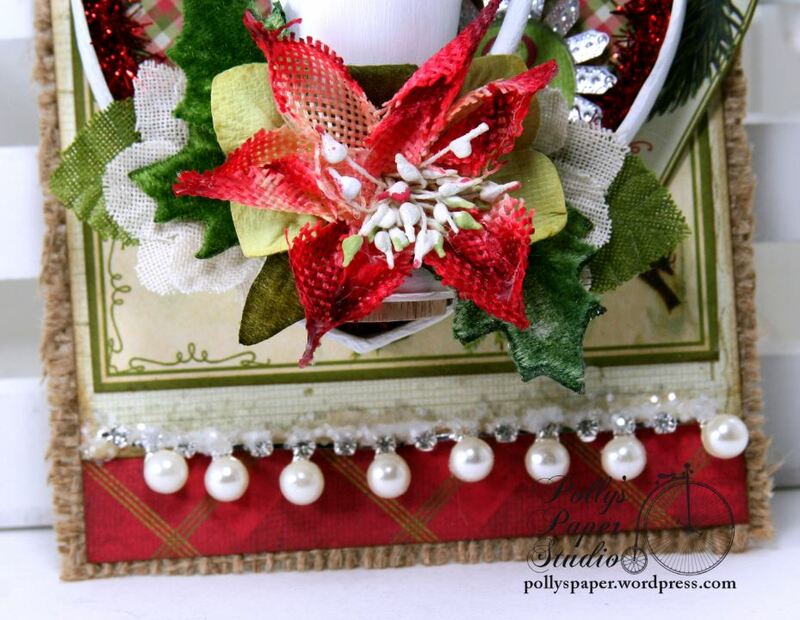 A little mixed media supplies to finish off the flowers and image finishes off the card with festive style. Hey there Peeps! 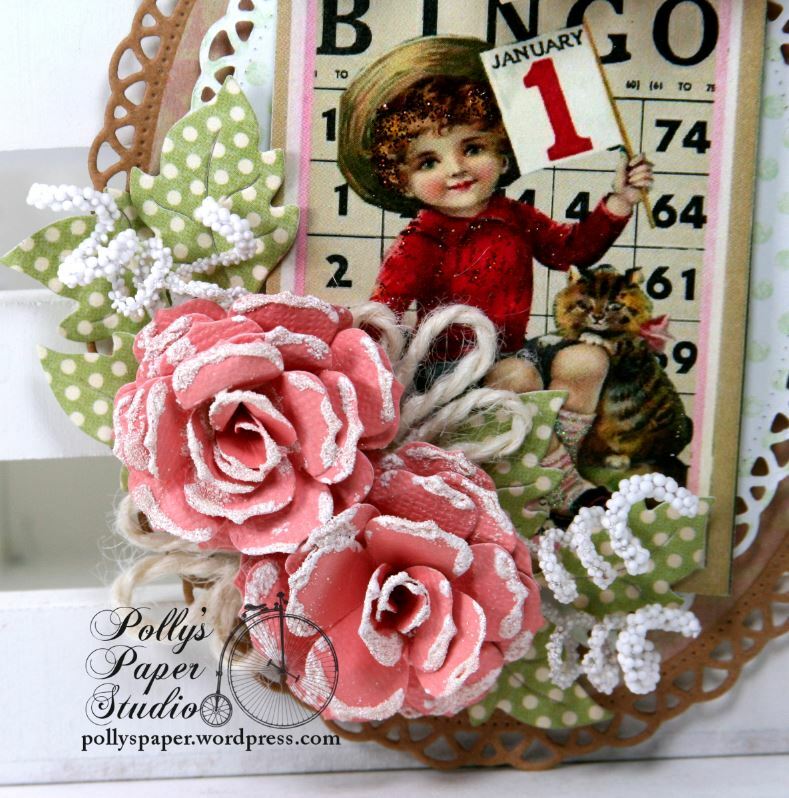 Ginny here to share a pair of tags that I created with the gorgeous blooms from Petaloo and vintagy papers from Authentique. 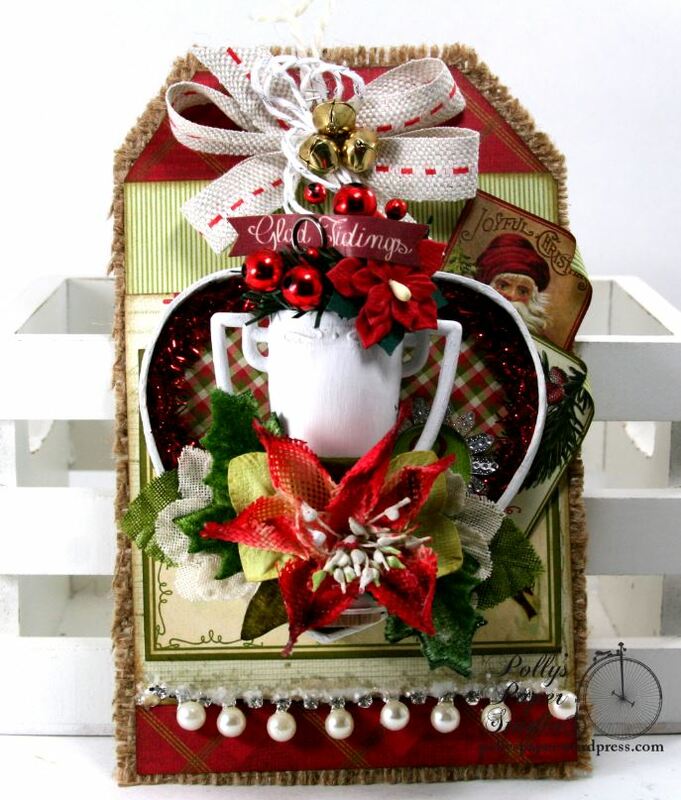 I started with a few similar elements like the little paper mache heart shadow boxes and painted trophies and added different but coordinating patterned papers, flowers and holiday embellies to 2 tags with loads of holiday style. 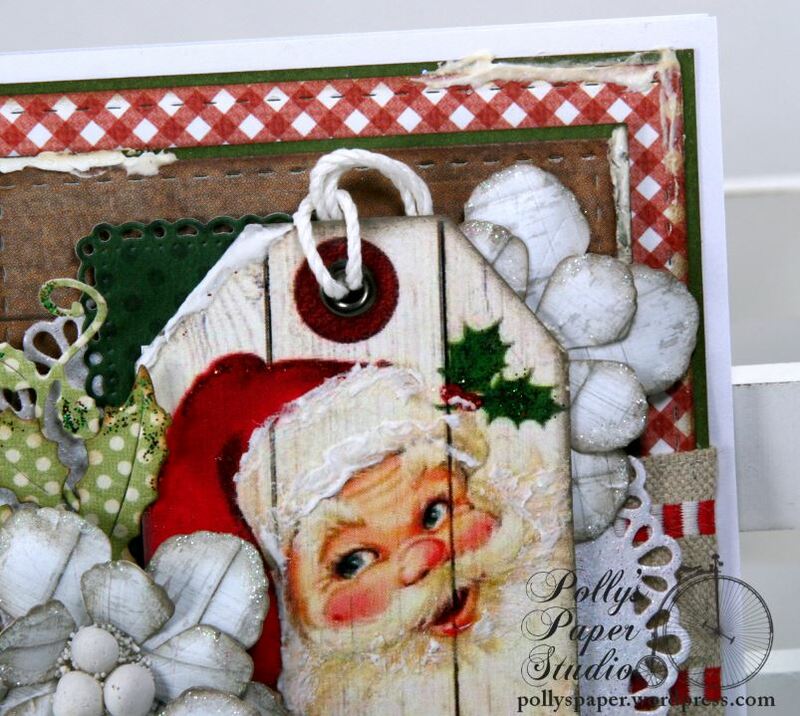 For this tag I’m using a sturdy base with burlap and layering on all the details. The paper mache heart box is just the perfect size to tuck in the painted trophy….that was just dumb luck….not planning…but I’ll take it. 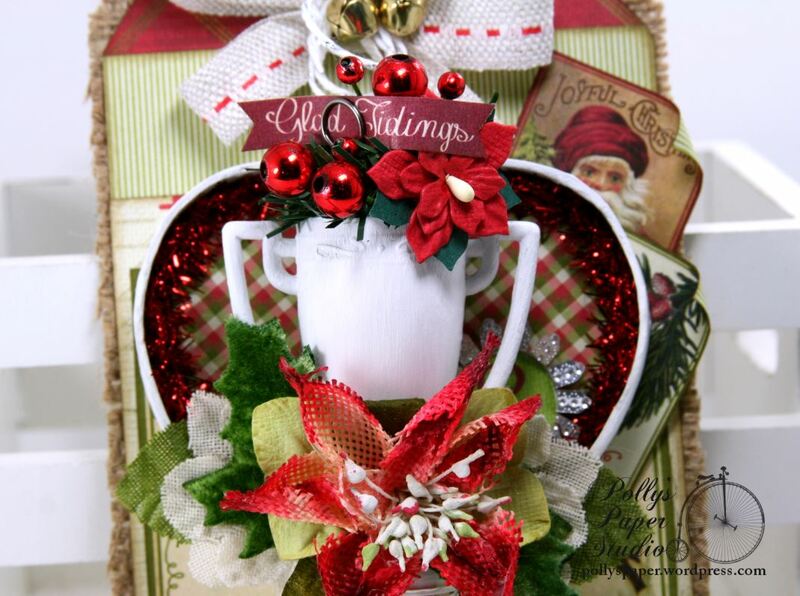 I’ve filled the trophy with parts of the Christmas pick and poinsettia and a tiny clip holding the sentiment banner. 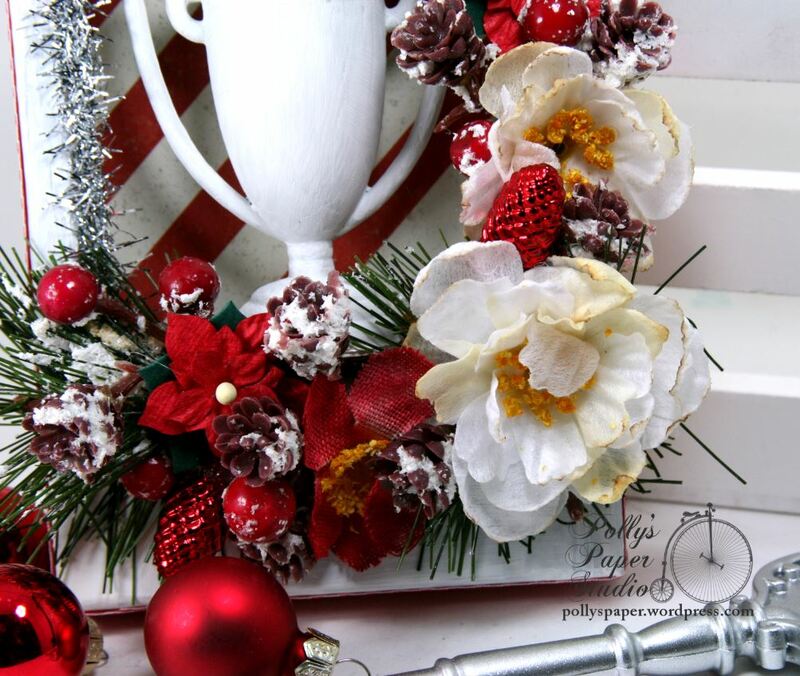 The gorgeous Petaloo flowers are arranged to feature the burlap bloom…..which is my personal fav holiday flower. I am so in love with the variety of textures from this flower selection. I’ve included a little blingy trim for sparkle and while the adhesive was wet I sprinkled on a bit of clear glitter for a faux-snow effect. 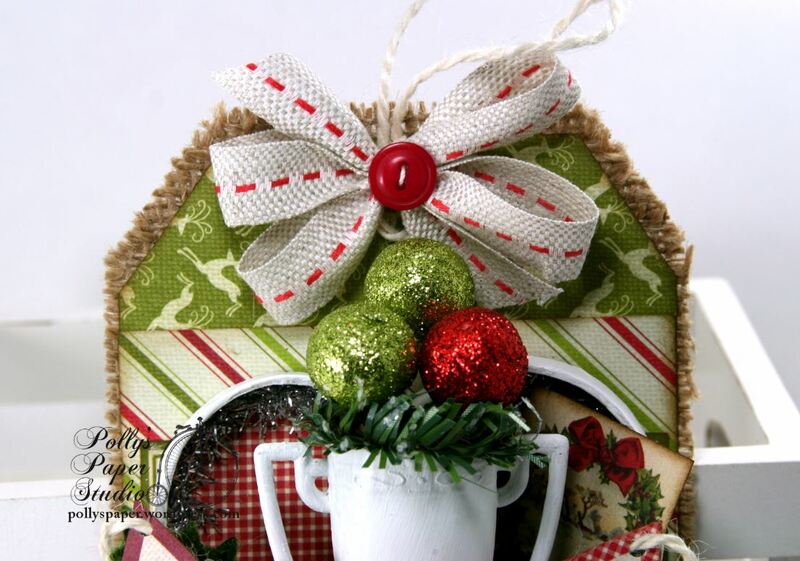 Jingle bells and burlap ribbon are the finishing touches for this holiday home décor tag. 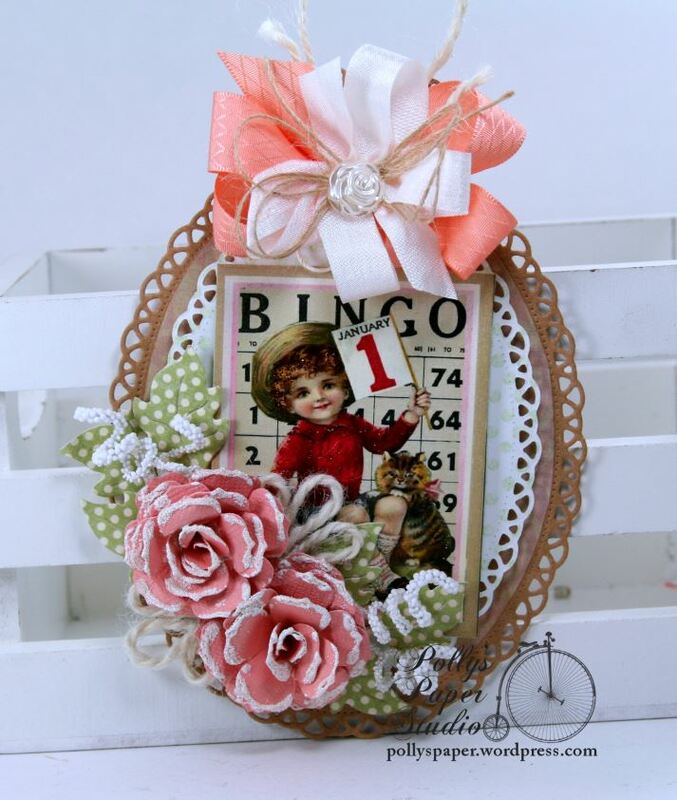 I was able to create this tag to be similar but different just by changing the papers and embellies. 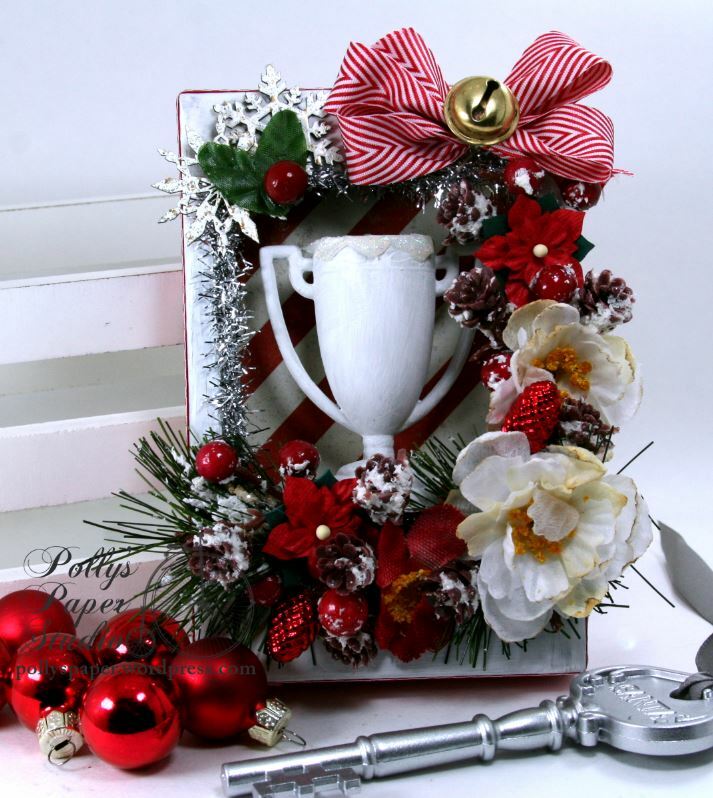 This time I’ve crafted a tiny banner from the sticker sheet and added it over the flowers and trophy…and it is for sure jolly! Tiny glitter foam balls take the place of the Christmas pick to fill the trophy. 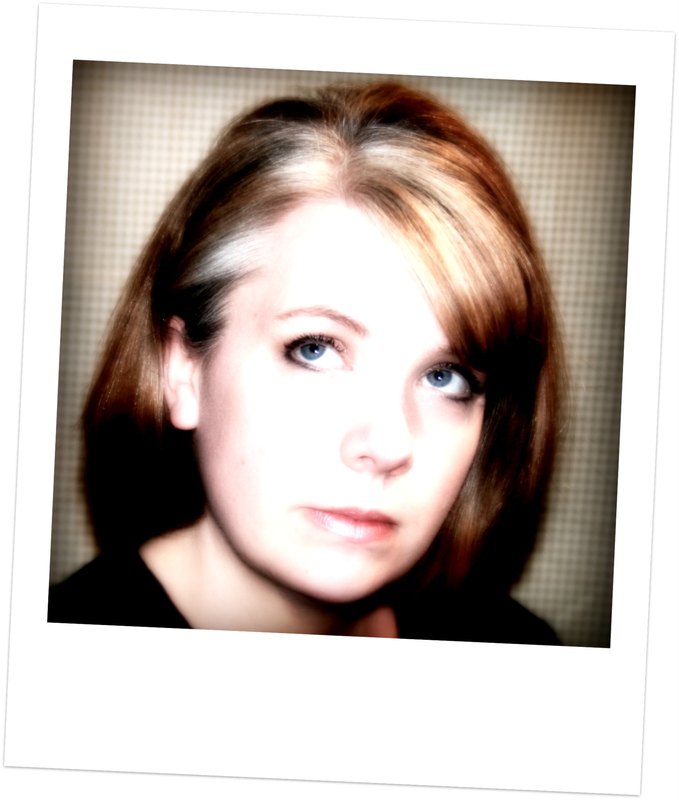 There’s an itty bitty vintagy image tucked in behind for depth. More of the tinsel trim in the back of the box but this time in silver over charming and country inspired plaid patterned paper. 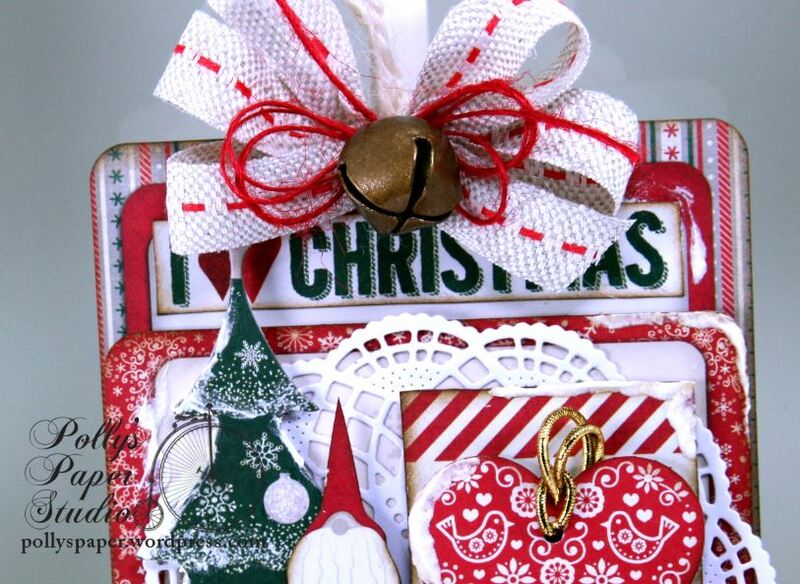 Blingy trim looks so festive over the tiny reindeer patterns and dresses this tag up so much you could hang it right on your Christmas tree and enjoy it as part of your favorite seasonal holiday décor. Hey there Peeps! 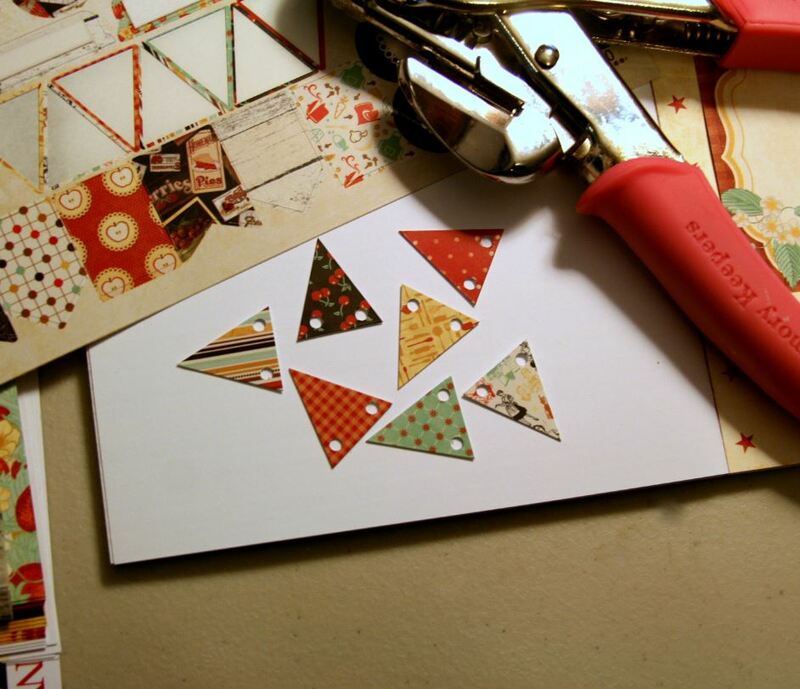 Ginny here and I’m excited to be sharing my project for the BoBunny – 3L Blog Hop. 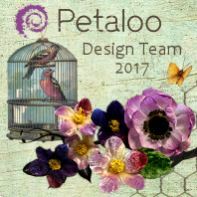 I chose to create a cover for my weekly menu planner . With a busy household and active kiddos we really need to plan our dinners ahead to avoid chaos and too much going out for meals. I found this awesome tablet with a week on each page so I can get the schedule down before I shop. I love these retro inspired colors and patterns. 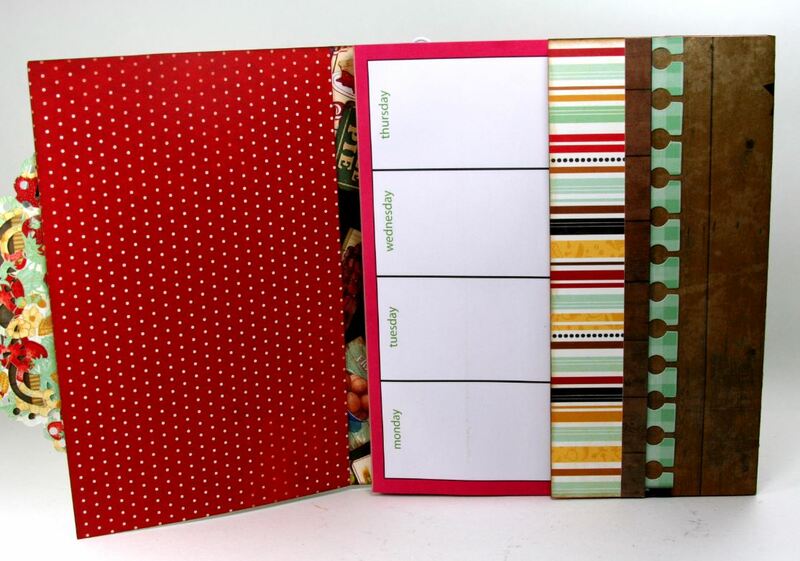 This is the planner all closed up. It will also be a nice décor piece for my kitchen displayed on a shelf. 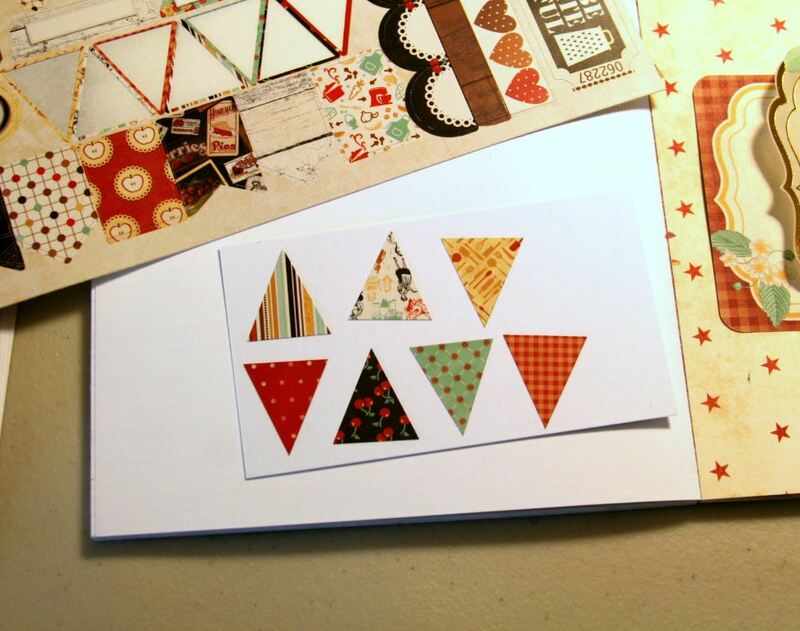 Lot’s of paper patterns here all piled up in one big happy arrangement topped off with a little dimensional banner and layered chipboard sticker. 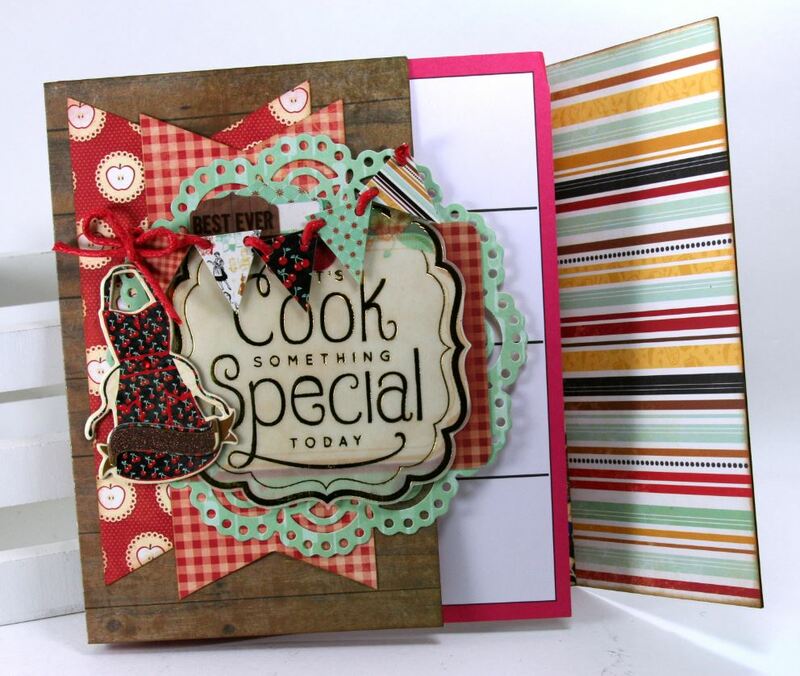 The inside is finished with the coordinating papers. You can see how easily I can just jot in the meals for each day. 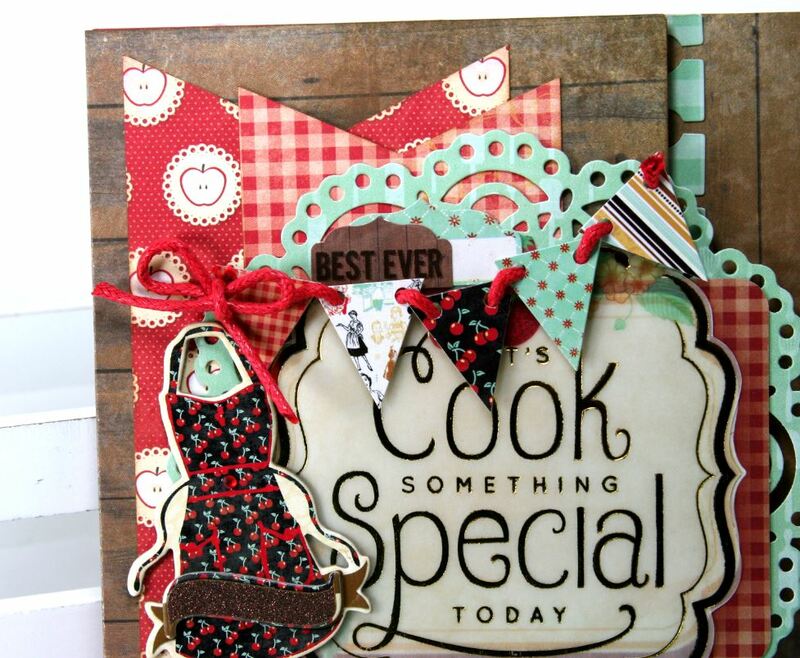 All the extra layers help to give sturdiness to this cover. 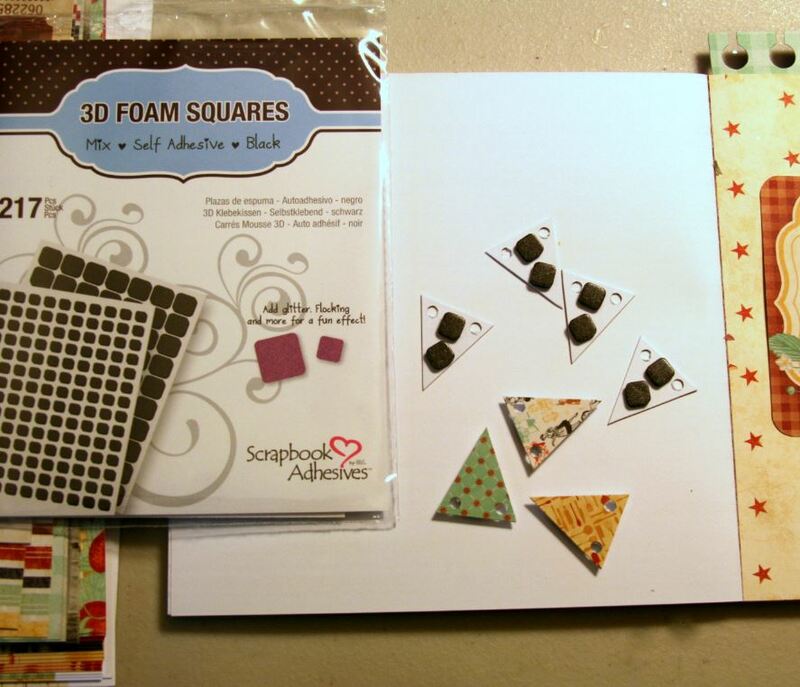 I also added a sheet of 110 lb cardstock on the back before covering with the polka dots. The tablet is held in with 2 large paper clips on the back so I can swap it out for a new one when this ones used up. Creating the banner was easy and fun. 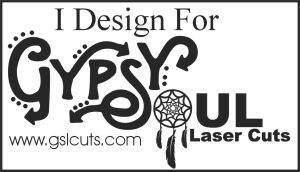 I used more of the 100 lb cardstock to adhere the banner shapes from the sticker sheet then cut them all out. I used my Cropodile to punch tiny holes. To give the banner dimension and to adhere it to the cover I used the 3L 3D Foam Spacers. Love these! This package has 2 sheets with big and little spacers so I didn’t have to clip them to fit, Yay!! !